IDENTIFICATION: Large ant-looking insects that aren’t ants or wasps. They are black and red-orange. The females are wingless and covered with dense hair and pack a painful sting. Males have different coloring, have wings and do not sting. BIOLOGY: Complete metamorphosis. Females lay eggs in ground nesting bee larvae and then pupate. HABITAT: Lone females patrol the ground especially in open sandy areas. Larvae are parasites of developing bumble bees. 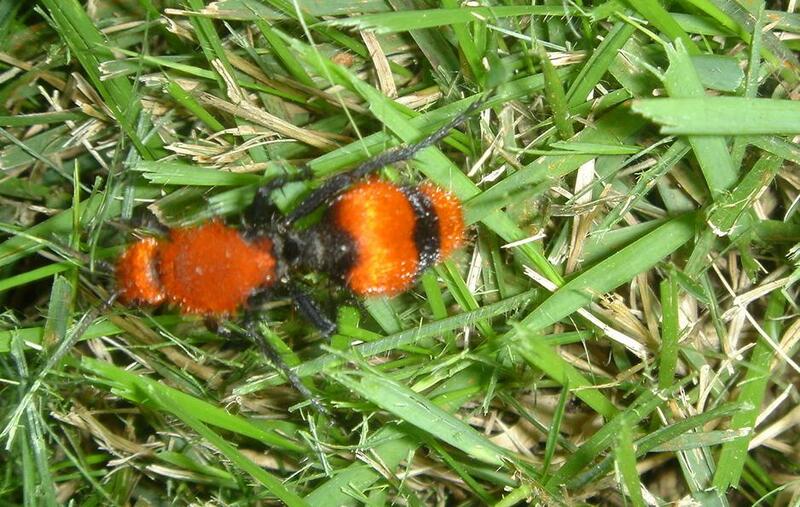 FEEDING HABITS: The velvet ant parasitizes cicada killers in the ground. The tough exoskeleton and hairy covering protects them from the powerful sting of the female wasps. ECONOMIC IMPORTANCE: Mostly just an interesting insect. NATURAL CONTROL: Healthy soil life. INSIGHT: This colorful insect squeaks audibly when stepped on. This information comes from the Dirt Doctor's Texas Bug Book. CLICK to purchase.